Our evaluation routine for storage bridges borrows heavily from the testing methodology for direct-attached storage devices. The testbed hardware is reused. CrystalDiskMark is used for a quick overview, as it helps determine availability of UASP support and provides some performance numbers under ideal scenarios. Real-world performance testing is done with our custom test suite involving robocopy bencharks and PCMark 8's storage bench. CrystalDiskMark uses four different access traces for reads and writes over a configurable region size. Two of the traces are sequential accesses, while two are 4K rando accesses. Internally, CrystalDiskMark uses the Microsoft DiskSpd storage testing tool. The 'Seq Q32T1' sequential traces use 128K block size with a queue depth of 32 from a single thread, while the '4K Q32T1' ones do random 4K accesses with the same queue and thread configurations. The plain 'Seq' traces use a 1MiB block size. The plain '4K' ones are similar to the '4K Q32T1' except that only a single queue and single thread are used. Comparing the '4K Q32T1' and '4K' numbers can quickly tell us whether the storage device supports NCQ (native command queuing) / UASP (USB-attached SCSI protocol). If the numbers for the two access traces are in the same ballpark, NCQ / UASP is not supported. This assumes that the host port / drivers on the PC support UASP. We can see that the ASM1352R bridge chip has no issues supporting UASP. 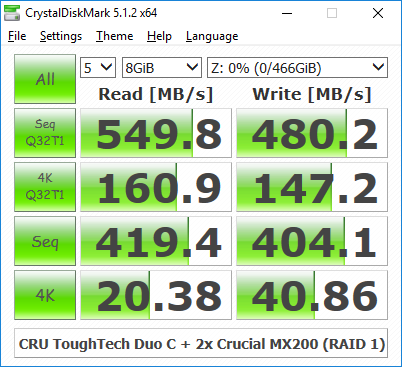 The RAID 1 benchmark numbers are quite close to what one might expect with a direct SATA connection for the SSD. 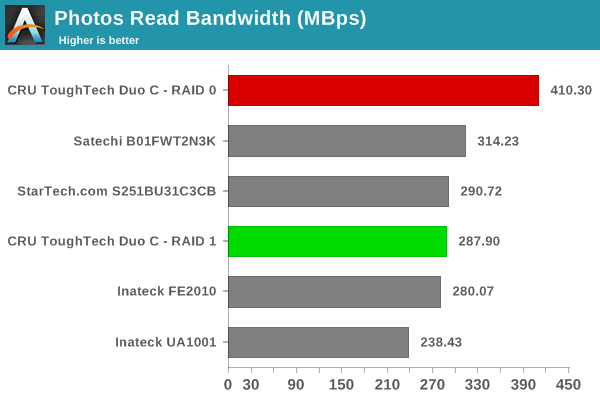 RAID 0 numbers are obviously better for the sequential accesses. 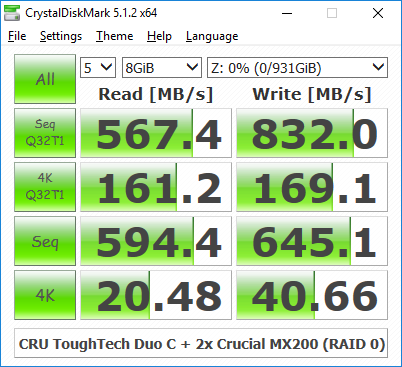 All these tests were done with two Crucial MX200 500GB SSDs configured in the appropriate RAID mode. Moving on to the real-world benchmarks, we first look at the results from our custom robocopy test. In this test, we transfer three folders with the following characteristics. The test starts off with the Photos folder in a RAM drive in the testbed. robocopy is used with default arguments to mirror it onto the storage drive under test. The content on the RAM drive is then deleted. robocopy is again used to transfer the content, but, from the storage drive under test to the RAM drive. The first segment gives the write speed, while the second one gives the read speed for the storage device. The segments end with the purge of the contents from the storage device. This process is repeated thrice and the average of all the runs is recorded as the performance number. The same procedure is adopted for the Videos and the BR folders. Readers interested in looking at all the graphs in one shot can choose the 'Expand All' option in the dropdown menu. The numbers show the obvious - given the sequential nature of the operations, the RAID 0 configuration wins the benchmark numbers hands down. 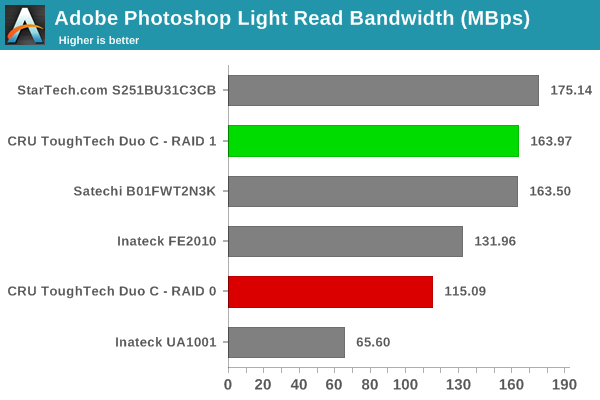 In the RAID 1 mode, the performance is similar to that of the other USB 3.1 Gen 2 storage bridges that we have evaluated before. High-performance external storage devices can also be used for editing multimedia files directly off the unit. They can also be used as OS-to-go boot drives. Evaluation of this aspect is done using PCMark 8's storage bench. The storage workload involves games as well as multimedia editing applications. The command line version allows us to cherry-pick storage traces to run on a target drive. We chose the following traces. Usually, PC Mark 8 reports time to complete the trace, but the detailed log report has the read and write bandwidth figures which we present in our performance tables. Note that the bandwidth number reported in the results don't involve idle time compression. Results might appear low, but that is part of the workload characteristic. Note that the same CPU is being used for all configurations. Therefore, comparing the numbers for each trace should be possible across different DAS units. Readers interested in looking at all the graphs in one shot can choose the 'Expand All' option in the dropdown menu. The real-world benchmark numbers show that editing operations do not always benefit from the RAID 0 mode.